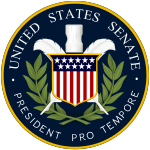 The President pro tempore (/ˌproʊ ˈtɛmpəriː/ or /ˌproʊ ˈtɛmpəreɪ/), or president pro tem, of the United States Senate is the longest serving Senator from the majority political party in the United States Senate. According to the Constitution, this is the fourth highest office in the United States. It is the third in the U.S. Presidential line of succession (behind the Vice President and the Speaker of the House). Many state senates also use the office of President pro tem. Officially the Vice President is person in charge of the Senate, but they are not a Senator. 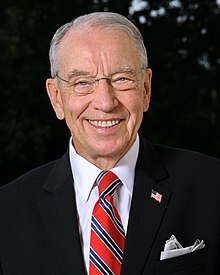 Chuck Grassley (R-IA) is the President pro tempore. When the Vice President cannot be in charge, the President pro tempore is in charge of the Senate. Many people still think of the President pro tempore as de facto president of the Senate. Benjamin Wade was only one vote away from becoming the President of the United States due to the impeachment of Andrew Johnson. No president pro tempore has taken over the presidency as of January 2019. When Senator Hubert Humphrey, a former Vice President of the United States, was seriously ill, the Senate showed its respect for him by creating the office of Deputy President Pro tempore for any former President or Vice President who is elected to the Senate. No Vice-President since Humphrey has done this. ↑ "Pro tempore Legal Definition". Lawyers.com. ↑ "Bill Text, 110th Congress (2007-2008), S.RES.6.ATS". Library of Congress. Retrieved 26 January 2015.